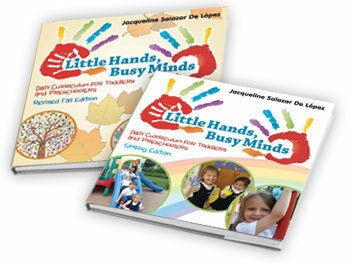 The Little Hands, Busy Minds books were created for teachers by a teacher. Each month is divided into four weekly segments. 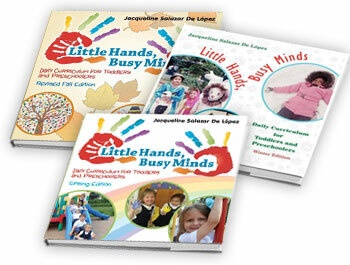 Each segment contains a sample letter to parents, a planning web and goal, and a complete guide of day-by-day activities that are easy to follow: art projects, math ideas, science experiments, songs and rhymes, recommended books to read, cooking ideas, and other easy-to-do activities for young learners. The books are aligned to state and national standards in literacy, math, science, creative arts, social studies and physical health and development. 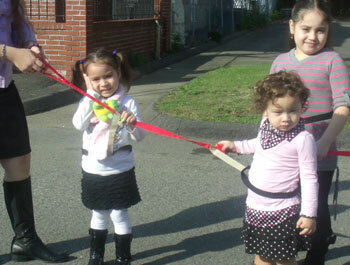 The Tot Trotter Safety Rope was designed by Jacqueline Lopez to provide a fun and orderly way to move children from one place to another in style! 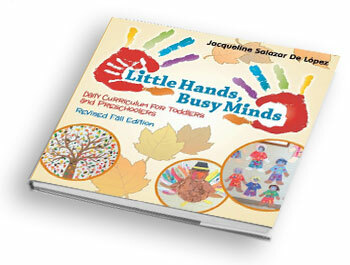 The Revised Fall Edition includes curriculum ideas for the months of September, October, and November. The book includes activities for all learning centers around themes such as back-to-school, fall fun, and community helpers. Each month contains a sample letter to parents and weekly planning webs and goals to delight little hands and engage busy minds. CLICK HERE to view sample pages! The Winter Edition includes curriculum ideas for the months of December, January and February. 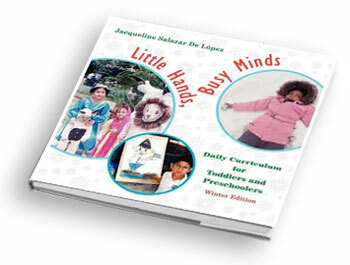 Similar to the Fall Edition, the Winter Edition contains a timely collection of daily art projects, math ideas, science experiments, songs, rhymes, and other fun, easy-to-do activities for young learners, all while teaching them about winter and how various cultures celebrate the holidays. CLICK HERE to view sample pages! 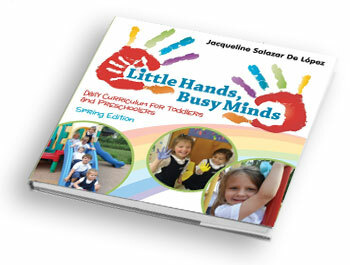 The Spring Edition includes curriculum ideas for the months of March, April and May. Similar to the Fall and Winter Editions, the Spring Edition has activities for all learning centers around themes such as animals, insects and modes of transportation. CLICK HERE to view sample pages! Have your curriculum ready for September through May! You will have nine months of daily art projects, math ideas, science experiments, songs, rhymes, and other fun, easy-to-do activities for young learners. Each month contains a sample letter to parents and weekly planning webs and goals to delight little hands and engage busy minds. Buy the Fall, Winter & Spring Edition together and save! You will have six months of daily art projects, math ideas, science experiments, songs, rhymes, and other fun, easy-to-do activities for young learners. Each month contains a sample letter to parents and weekly planning webs and goals to delight little hands and engage busy minds. Buy 2 Editions together and save! Features: Strong and durable webbing polypropylene straps; Adjustable belts to secure children to the rope; Colorful wooden shapes that children can easily grasp; Customized to fit as many as 20 children; Easy storage; Perfect for field trips; For ages 1 and up. To order a customized rope uniquely designed to meet your center's needs and number of children, please e-mail us.